During the winter of 1904, a man named King C. Gillette was granted a patent for a “Safety” Razor — a razor with a safe, inexpensive, and disposable blade. It took six years for Gillette’s idea to evolve, but with time, the brand became a success. Shortly after, the U.S. Government began issuing the safety razors to the entire armed forces and Gillette became a household name. To this day, Gillette has remained on top of the shaving industry, but the company has since turned its attention to multi-blade razors. While convenient, many people are still in search of that “classic” shave that only a safety razor can provide. After all, this old-school tradition is still the way to go, as safety razors are not only cheaper, but better for your skin as well. The benefits of shaving with a safety razor include reduction of skin irritation, shave bumps, and ingrown hairs, most of which are caused by cartridge or electric razors. 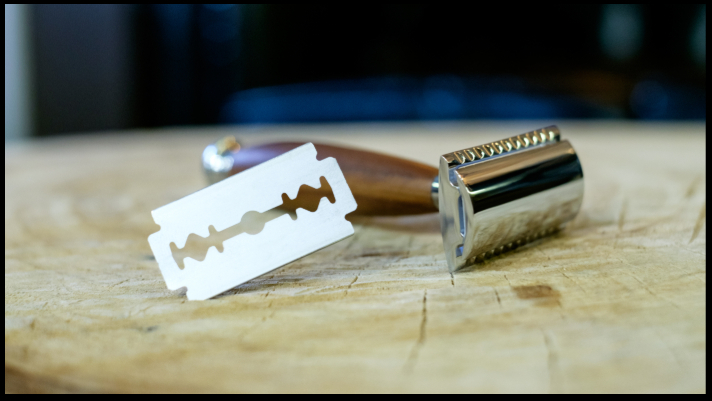 The main reason is that, with a safety razor, you only have one blade against your skin at any time rather than five. Another benefit of using one blade — the price! Depending on your preferred brand, some people can save up to $3,000 over the course of 10 years. Talk about a bargain! If you are in search of the Ultimate Shave, a visit to Modern Male is the next step. Book an appointment with us today (614-588-0550) after checking out our plethora of shaving services ONLINE. Our blend of classic methods and luxurious products, such as Taylor of Old Bond Street Shave Cream, will leave you in complete relaxation as you receive the closest shave possible. Upon check out, take a trip down memory lane as you browse the shelves at Modern Male. From razor blades, badger brushes, and complete shave sets — Modern Male has the tools to get you on the path to a better shave.